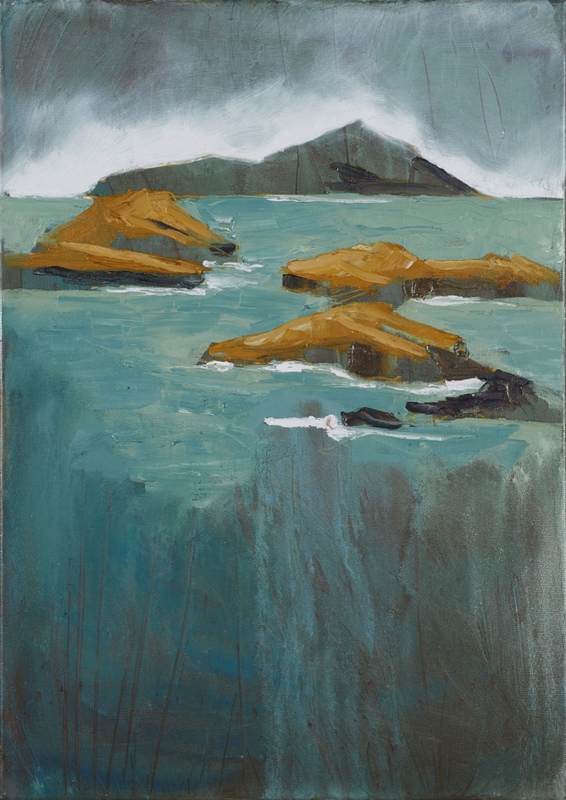 “For 15 years I have been painting en plein air, it’s my conversation with the Irish landscape. Water is a re-occurring theme, drawing me to mountain lakes, rivers and the oceans and coastlines. This body of work is a new departure born out the marriage between two earlier phases of my work. Atmospherics was a period during the naughties where I distressed and melted-down plein air paintings back at the studio. During the atmospherics time my approach became looser and less detailed and the element of chance was given free reign. At some point I became beguiled by the image before it went through the atmospheric mangle and decided to freeze the process at that point. The result was a crisp hard-edged image where the colours are not allowed to bleed and yet detail was at a minimum. WATERS SOFT AND WILD – Kerry and Wicklow: Meeting of Waters is my first body of work where atmospherics fuse with palette knife work. The resulting images celebrate yin and yang, where one element of the painting is under a spotlight of clarity and rest dissolves into an ambiguous area celebrating the beauty of oil on canvas. 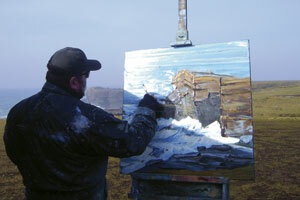 As a plein air artist my work takes me far and wide. And this collection takes in the east and west coasts of Ireland including a short visit to Cornwall”. Rod Coyne is one of only two Irish artists successful in a public vote selected for Britain’s Open Art Competition (NOA) run by the Chichester Art Trust. This is the first year NOA (Patron Ronnie Wood) opened the Competition and Exhibition Tour to artists in the Republic of Ireland. Hughie O’Donoghue is Chief Judge.